We have two options for you to explore real estate investment opportunities this winter and spring! Jason Kogok, the co-owner of Your LuxuryMovers Real Estate Team, is a licensed real estate broker, has his General Contractors license, and a wealth of knowledge and expertise in investment properties. He enjoys fixing up homes in his spare time, and is offering his personal and professional experience through a one day seminar, and a multi-week course. Jason Kogok will be presenting a one day seminar at NCSU’s McKimmon Center for Extension and Continuing Education, on January 28, 2019. This course, designed for novice to intermediate investors who are looking to start or grow their investment portfolio, will thoroughly examine various real estate investment opportunities to build future wealth and passive income. 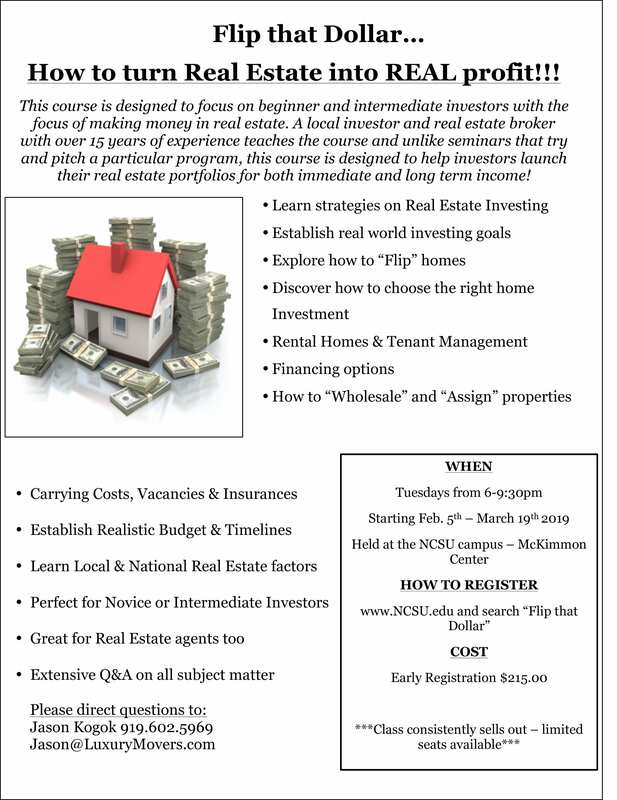 This is a true, real-world course that will study real examples from the North Carolina real estate market. You will dive deep into rental homes in the local market as a way to build a portfolio–from the initial setting of goals to financing the property; through budgets, cash flows, depreciation, analysis of investments, and even taxes and future profit realization. Discussion will also go into LLCs and the set-up of those structures for real estate, along with insurances and evictions. Read more about the course and register here. 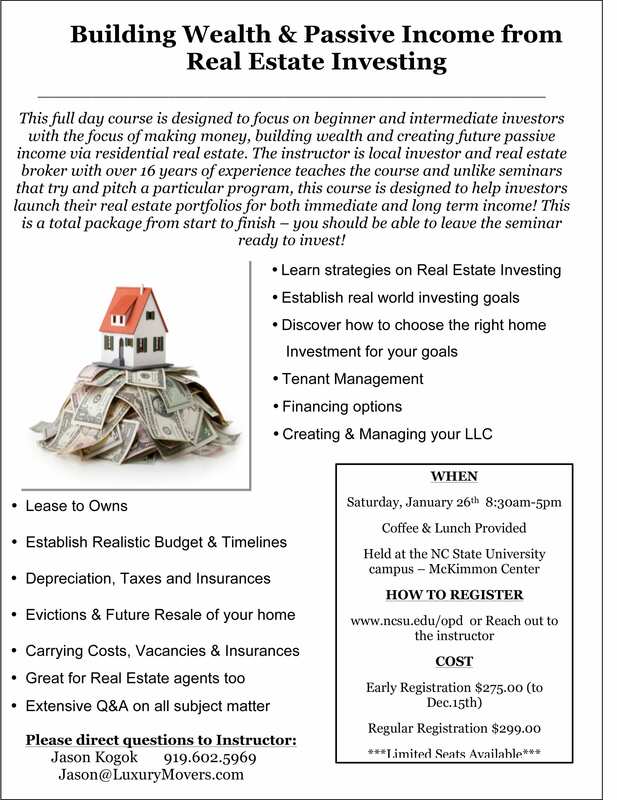 Jason will be also be teaching “Flip That Dollar – How To Turn Real Estate Into Real Profit ” at the NCSU campus – McKimmon Center this spring, starting on Feburary 5, 2019. This eight week course examines investment opportunities in real estate, including personal residences, rental properties, and “flips,” and shows participants how to determine which investment are smart ones. Register here. The class is great for novice investors or real estate agents trying to improve on the investment market. As a matter of fact, over 70% of attendees have been Realtors or novice investors! The course covers flips, as well as rentals, financing, goal setting, hard money, taxes, foreclosures/short sales/pre-foreclosures, etc. We analyze real properties in real situations. Registration is open online on NC State McKimmon Center’s registration page available here. Space fills up quickly! For more information, visit the McKimmon Center’s website or contact Jason at jason@luxurymovers.com or call/text 919-602-5969.